2014 has been an amazing year for my online business and I hope your business is doing as well as mine! Jim Rohn once said, “If you will change, everything will change for you“. I really took that statement to heart and decided to make some changes. In the later part of 2013, I came to realize that what I thought I was doing in my business was exactly what I should NOT be doing. The more I look at it now, coming from a different perception, had I continued with the same mindset, my business, which had plateaued, would have inevitably tanked. I attribute my success to being trainable, coachable and willing to make changes. I no longer am an individual that “thinks outside the box”, I am now a “box maker”. I have now become the product creator instead of trying to find products to promote. My products promote MY brand and if I decide to promote as an affiliate, it’s by choice and not by necessity. In early January, I was introduced to Charles Mohr. Charlie’s concepts and ideas coupled with his technical and marketing skills were so outside the realm of my thinking that I can honestly say “I felt like a newbie”. I hired him and we got to work. We re-branded every product in my inventory, created new sales and landing pages. No detail was small enough and no stone was left unturned. If the product or content did not fit, then it was changed, modified or even deleted. This process took nearly three months to accomplish and it was by far the best training and coaching I had every received. What emerged was a new business model which has now become the backbone of my online web enterprise, rock solid and built on a foundation that allows for a growth potential that is limitless. I stopped spending money on online courses. I stopped trying to split my time between mentors and gurus. I stopped following so-called mentors that kept preaching hype or scumbag marketing techniques which kept making them money but in the mean time kept draining my bank account. What I was spending per month is now what I am making in a week! It is because I believed in myself that Charlie believed in me. As we close out 2014, I am proud to announce a new partnership. My web designer/marketing specialist, Charles Mohr, offered me a partnership. 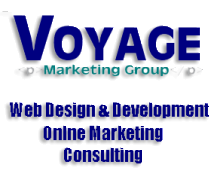 Hence, Voyage Marketing Group was created. And soon, we will be entering a new year with inevitably more change. Our goal is to grow Voyage Marketing Group into a unique business comprised of talented professionals with a common vision. Will you be our next graphic designer, copywriter or social media solutionist? As for our clients, they will bring their inspired mission while we bring the strategic vision, creative artistry, engineering talent and marketing know-how to make it happen honestly and with integrity. In view of another exciting year ahead of us, we join together to wish you health, prosperity and infinite success that a well planned, well oiled online business can reward you with.